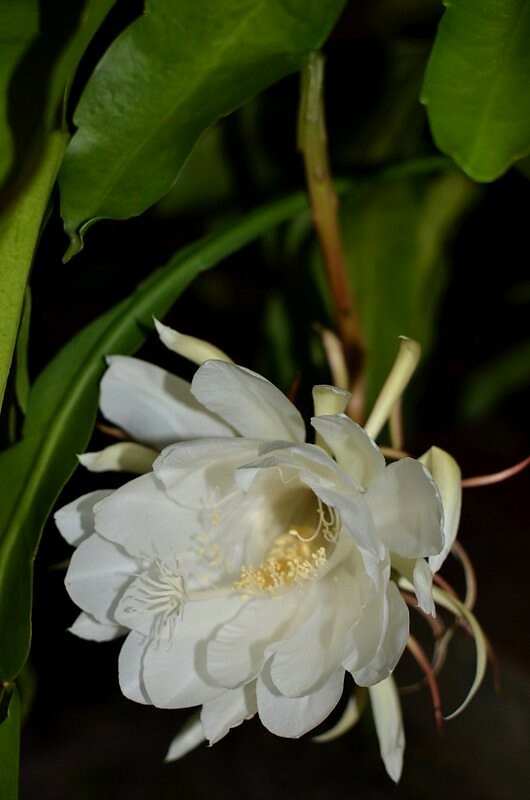 Queen of the night, the size of my outstretched hand, is ethereally beautiful. 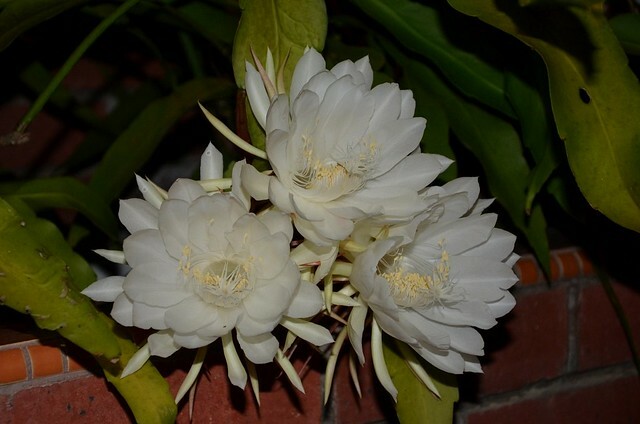 Queen of The Night, Nightblooming Cereus, tan hua (Chinese), 9 O'Clock Flower (Sabah/Malaysia) and many more names are awarded to this delicate and beautiful bloom. This cactus flower reminds me of my parents who stayed up to wait for the buds of the Selenicereus grandiflorus to catch their beauty at their fullest at 9 pm. When I checked on the buds of my pot of tan hua (given by my in-laws') at 9 pm last night, they were still not fully opened. It was 10 pm when they opened to their fullest and I realized that the delay was due to the one-hour backward adjustment when East Malaysia time was synchronized with West Malaysia's more than ten years ago. Do you also realize that 6:30 am in the morning these days (height of summer in the northern hemisphere; Sabah is slighlty above the Equator) is like 9 am in December, bright and already warm? We were summoned to my in-laws' at 11 pm Saturday night to see the blooming of their tan hua (a name which when applied to a person means a someone who makes a big but brief impression). The flower's Chinese name is very descriptive of this flower because it rarely flowers and when it does, it is awesomely beautiful and scented but only lasts one night. The tan hua's ephemeral life evokes a kind of mysticism and romanticism. Each time I see a tan hua open, I am reminded of how brief life is, even when things are going perfectly well. It is a flower that epitomizes the briefness and bittersweetness of life. MIL has about 10 pots of 40-year-old tan hua. More correctly, they are descended from plants propagated over the years from the original plants. 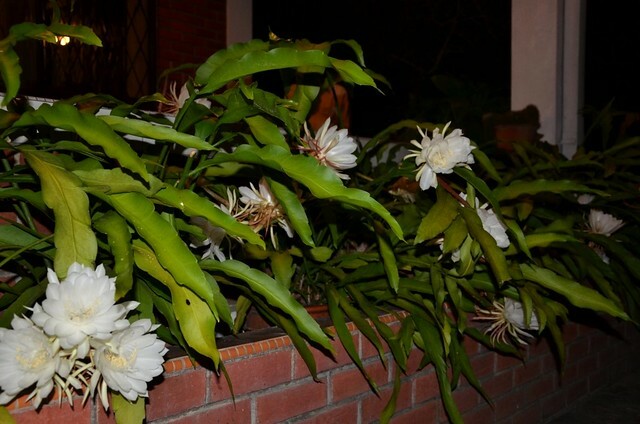 Last Friday, there were about 20 blooms and the next night, about 27. That isn't the record because many years ago, we counted over 50 blooms in one night. I took dozens of photos of the beautiful flowers but in the end, only those photos taken with the flash turned out good. There's still so much to learn about photography, especially in low light. I think the tan hua is related to the dragonfruit, another cactus. I remember my mom cooked a pork and tan hua soup once although she doesn't remember it now. I still remember how it tasted--pleasant and a little bit slimy on the stalks. I wonder if they are good stuffed with mozzarella and deep-fried, like zucchini flowers? I ate this dish at a pot luck dinner a few months ago and thought it was the best dish that night. Just when I wanted to call Flora for the recipe, I bumped into her at the wet market. She ranted off the ingredients and I ran home to cook the dish for some special guests visiting from Holland and the States. It was a hit with my guests although I didn't taste it myself. Brinjals are delicious and I prefer them to eggplants for Asian cooking. Brinjals are narrow and long with a thin skin and soft flesh while eggplants are large, bulbous and have thick skin and firmer flesh. 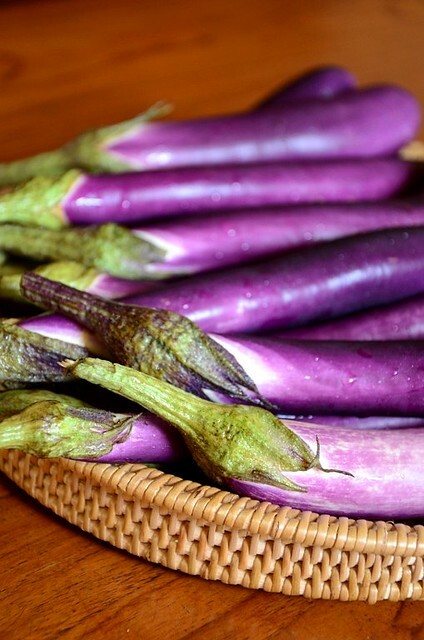 The two most common brinjals here are the 'curry' brinjals with thick, deep purple skin and plenty of seeds and the Taiwan brinjals which have a lighter, thinner purple skin, soft tender flesh and very few seeds. Taiwan brinjals are very good steamed and topped with crispy fried red onions or garlic, the oil the garlic/onions were fried in and light soy sauce, Maggi seasoning sauce being the best for this dish. 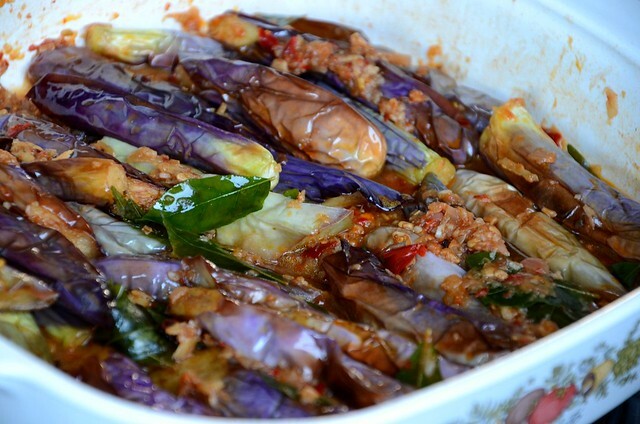 I love brinjals stewed with salted fish but with all the talk about salted fish having Ridsect sprayed on them (I have seen it myself) to ward away flies, I use canned anchovies and although the dish is not the same, it is delicious. I bought some baby brinjals recently and cooked Flora's recipe but it turned out that the baby brinjals were too tender for this recipe. 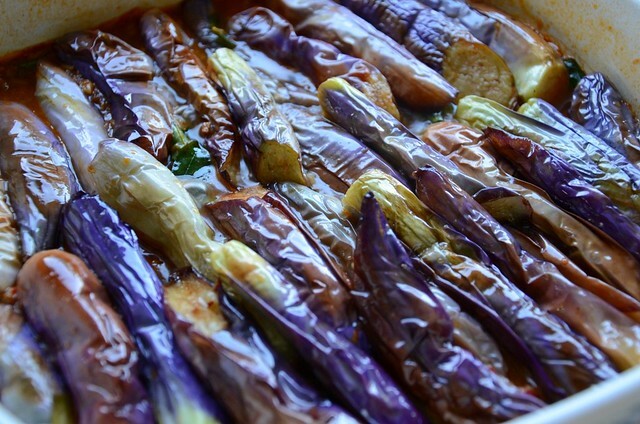 I would stick with the regular mature brinjals and use baby brinjals for steaming instead. I was told that this is an Indian-Malay dish and that cuisine is quite alien to me (I do love it once in a while, especially the roti canais and the curries), I'm naming this dish brinjals alba, after the alba seeds used. Of course if you google that you'll get a photo of Jessica Alba, one of the prettiest faces in the world. The amount of ingredients can be adjusted to your taste and in fact you should experiment with this dish because the recipe here is a rough estimate. 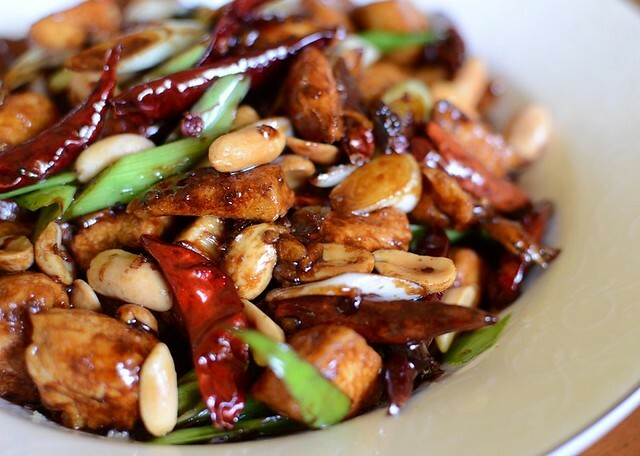 This dish goes well with plain rice and maybe a curry or a fried fish. YUM. 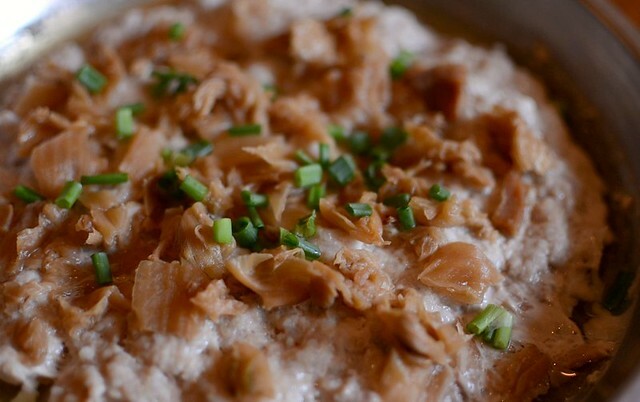 Optional: small handful of dried shrimps, washed and soaked for 5 minutes to soften, then chopped finely. Save the soaking water. 1. Cut the brinjals into 2 or 4 lengthwise and then into 2 crosswise to get thick long slices. Pound the ginger, onions, garlic and chilies in a mortar into fine paste. If the amount seems too little, make more. There should be about 4 tablespoons for 1/2 kg brinjals. Put the assam jawa into a small bowl, add about 1/4 cup warm water and massage the seeds until the water is thick. Strain juice through a small sieve and discard the seeds and pulp. 2. Heat up 1 cup of veg oil and fry the brinjals in batches until golden brown. Drain on paper towels. Note: I think that the brinjals can be brushed with oil and roasted in the oven too. It'll be healthier that way. 3. In a casserole dish (if serving in it) or frying pan, fry the pounded ingredients (if using dried shrimps, add that too) in 2 T of oil until fragrant, about 3 minutes. 4. 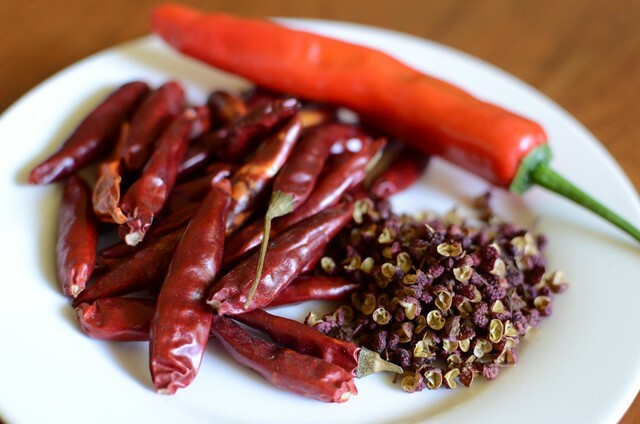 Add the alba seeds and curry leaves, fry for a few seconds and then add the assam juice, sugar and salt to taste. Pour in the stock and water from soaking the dried shrimps, stir well and when sauce is slightly thickened, add the fried brinjals. Season with salt and sugar. Cover and let simmer (low fire) for 5 to 7 minutes. Carefully lift the brinjals from the bottom to the top so that those brinjals at the top will have a chance to soak in the sauce too. Taste and season if necessary. Let cook another 2 minutes before turning off heat. Good to let it sit and re-heat for better flavor. 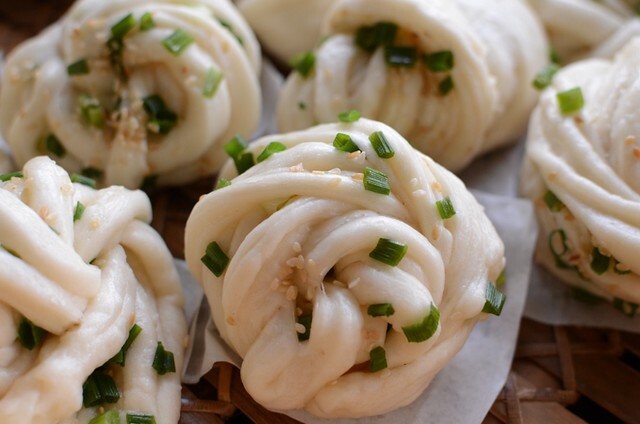 Flower twist buns (hua juan) with spring onions, salt and sesame seeds. 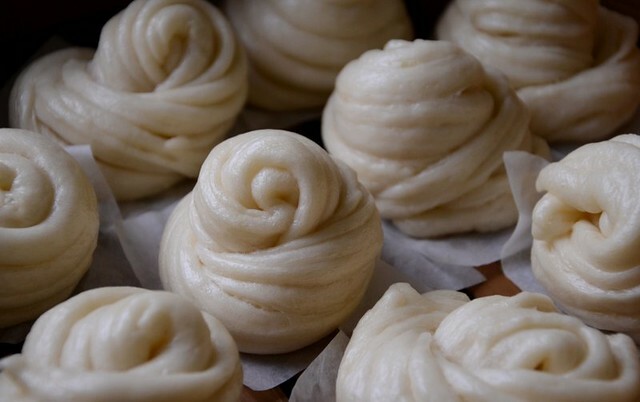 I know I've posted on mantou (Chinese buns) before but there's a good reason for re-posting: improvement to the recipe and a new way of shaping the buns, which I came up with based on the shape of the buns I ate at a local restaurant. The amount of water was too little in my previous Chinese buns recipe. 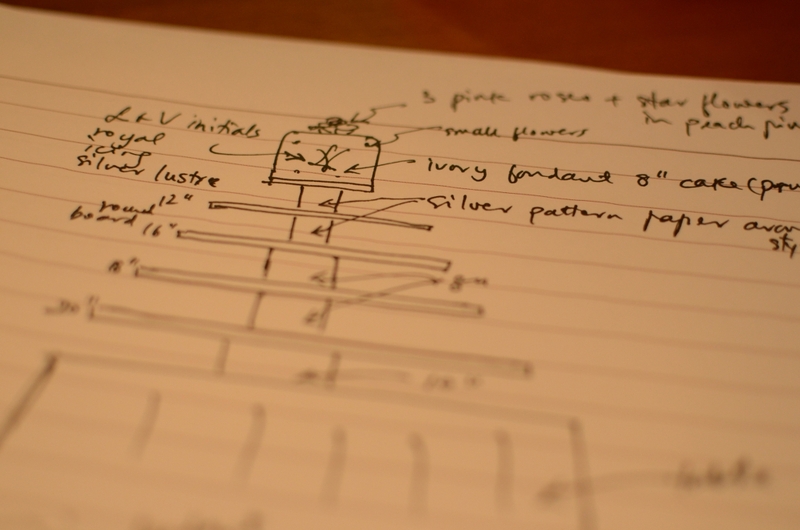 Maybe it's true that some chefs don't teach you everything or reveal the full recipe. I've been testing and improving the basic bao recipe which I learnt in a bao-making course years ago and I found that if I add a lot more water to the original recipe, the buns will be softer and moister. I also don't bother to get special bao or Hong Kong flour, both of which are very fine and white (read: bleached) flours. I am sticking to plain flour, and I particularly like the good old Rose Flour for making Chinese buns. 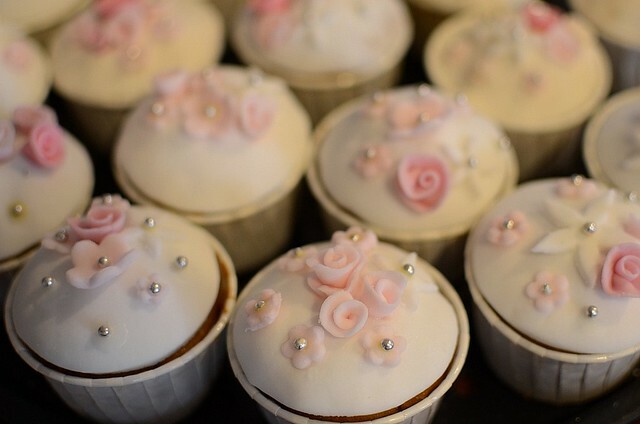 Rose Flour is not highly bleached so it gives a yellowish tint to the buns but the fragrance of the flour will more than make up for the less-desirable color. Last week, I had a craving for home-made (read: ammonia-free) buns. 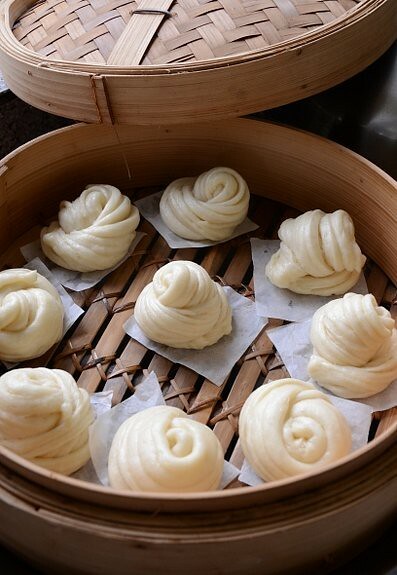 Home-made buns are good when just out of the steamer but once they cool, they loose some of the softness because ammonia and other additives are not added to the dough. The point of home-made food is to avoid all those commercial chemicals as much as possible but if you insist, then get Hong Kong flour or bao flour which will give a finer and softer texture. The dough must be kneaded very well, preferably with a machine. I've not had good results making dough with my hands in the past but because my cake mixer is still not repaired, I had to use my hands and the buns still turned out soft so I think if you keep to the amount of flour in the recipe, kneading by hands still gives good results. 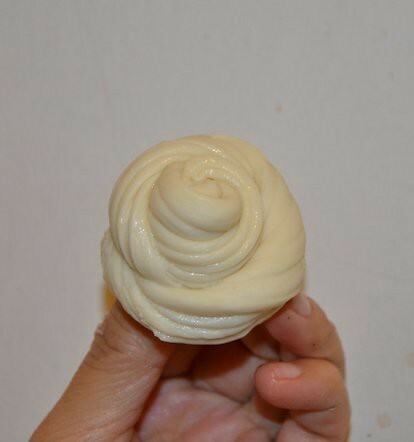 I've updated my Chinese buns posts--the baos, the mantou and flower buns recipes are one and the same. Now get a packet of plain flour and practice making plain buns to go with one of my best recipes: spicy gong bao chicken, coming up next. *If you use 250 ml and you are kneading by hand, add 200 ml first and knead in the remainder slowly, 10 to 15 ml each time, so that the dough is not too sticky to handle. Depending on the type of flour, you may not need all the water. 1. Sift the flour and baking powder together (usually I don't bother if the flour is fresh). If using shortening, rub it into the flour evenly. 2. Mix A with all the B ingredients in a mixer bowl and knead at medium speed till very smooth, about 6-8 minutes. The dough should be quite soft. Never mind if it's slighty sticky. Continue kneading until it isn't sticky. If kneading with hands, put dough back into the bowl and cover with a cloth. Rest for 30 min or until doubled, depending on room temperature. 3. Divide dough into 50g portions for larger buns or into golf-ball portions for dainty buns. Dust your hands and the work surface lightly with some flour. Sometimes I don't because this dough doesn't stick. Flatten each ball, roll into a small oval shape as long as your hand and about 3 to 4 cm wide. 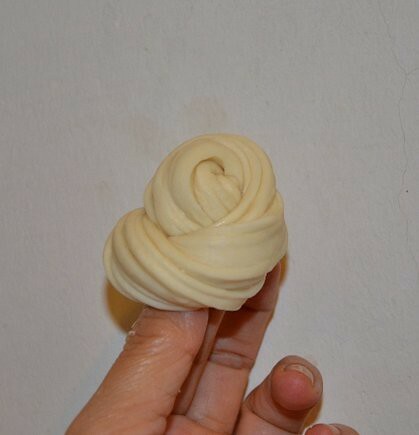 Use a metal pastry cutter and cut the dough into thin strips of 1/2 cm, thinner than that if you are making mini buns. 4. 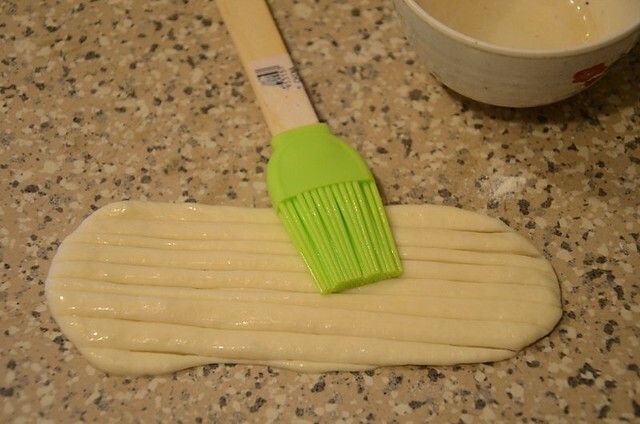 Brush the cut strips of dough with veggie oil. 5. Take the ends of the dough, one end in each hand, and twist around your thumb and tips of your forefinger. 6. Stretch the dough by pulling gently as you twist it around the tips of your thumb and forefinger. Tuck the end underneath the bun by pulling the last bit down to meet the other end that's at the bottom. Got it? 7. Here's how it looks from the top: a tight coil, like a chignon. I feel so clever that I figured this out. It must be from playing with my daughter's long hair. 8. Place the buns on a small square of baking paper to proof. Let the buns proof for 30-45 minutes or until doubled. Do not overprove or buns will wrinkle when steamed. 9. Steam at high heat for 4 minutes for small buns, 5 to 6 minutes for larger buns. A bamboo steamer basket gives best results because the steam can escape instead of dripping onto the buns and messing them. 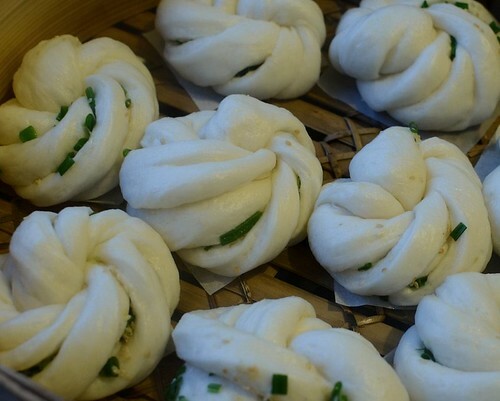 Note: To make flower buns with spring onions (Lily from Jiangxi told me that this is how her dad makes the buns), mix finely-cut spring onions, salt and veg oil or sesame oil and spread over the rolled out dough. I used sesame seeds too for extra flavor. I got a message purported sent by my pastor through www.myZamana and opened it. After logging in, I suspected it was spam but it was too late. Many of you wrote to ask; you are smarter than me. Please don't open it! A Chinese meal is not complete without a soup. 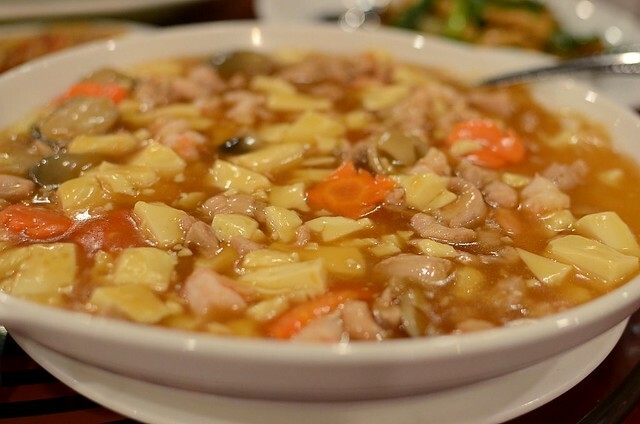 Most quick Chinese soups are thin and rather bland because such soups are for refreshing the palate in between mouthfuls of food, and also to moisten the throat and help glide rice down the gullet. Many kids and older Chinese cannot swallow their rice without spoonfuls of soup. When they were toddlers, my kids survived on good nutritious soups and bowls of rice. Simmered (usually 2 hours) Chinese soups are also thin but fortified with veggies, herbs, bones and meat into very nutritious and delicious soups. Such soups are drunk all through the meals with constant refills. Soups served at fancy banquet dinners on the other hand are always thickened with cornstarch to give them more body (and I suspect to cater to western palates) and are served as a one-off item at the beginning of 10-course dinners. 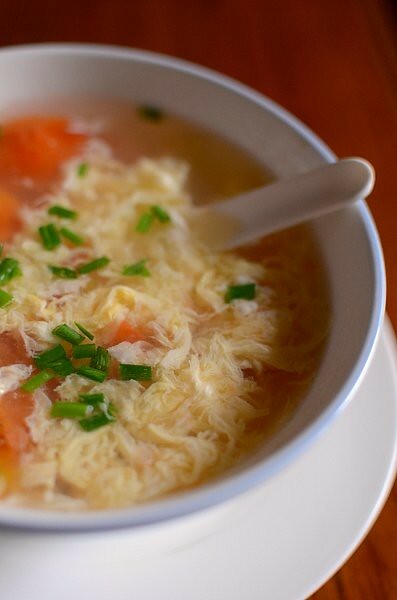 The tangy, oil-free tomato egg flower soup counters the greasy richness of meat dishes very well. Fan jeh dan hua tang, word for word, means tomato egg flower soup. 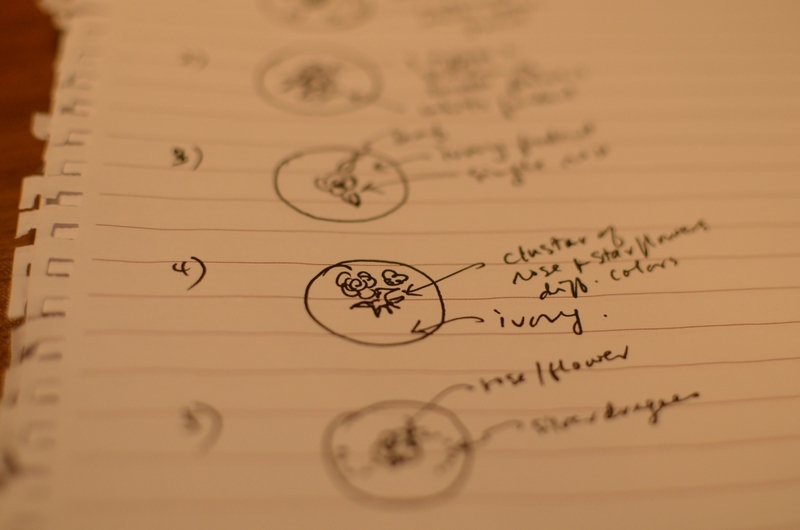 The flower refers to the delicate strands of egg that float in the soup. Dan hua tang is good for emergencies when a soup is needed on the table. Only eggs and good chicken stock (make your own from chicken bones, or use instant canned stock) are required. 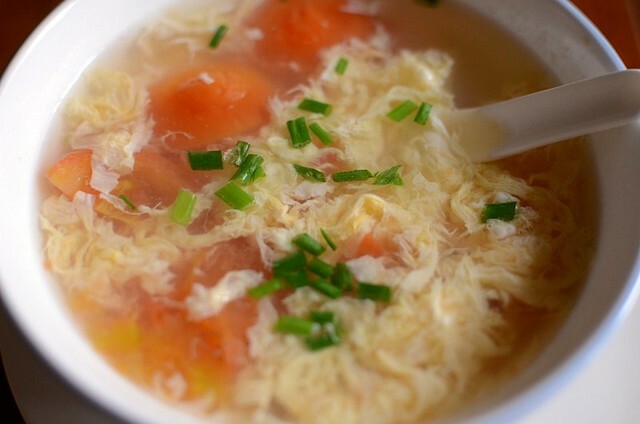 Tomatoes are the most common ingredient to add to egg flower soup. My mom adds dried shrimps to her egg flower soups too, to give extra flavor. For a slightly richer and more substantial version, ground meat, jai chai (a preserved veggie) and thin glass noodles can be added too. Whichever way it's done, the important thing about dan hua tang is that the egg strands should be wispy and light, not clumpy and tough. To get fine wisps of egg, the beaten egg must be poured into very hot boiling soup with one hand and stirred in a circular motion with the other hand at the same time. The soup must be very boiling hot or the eggs will not set immediately and so will cloud the soup when stirred. Watch out too that the soup must not be boiled after the egg is added, or the egg will be hard. When your egg strands look like fine cirrus clouds, you have mastered the making of the egg flower soup. Do not confuse egg flower soup with egg drop soup. A lot of Chinese menus say egg drop soup when they mean egg flower soup. Egg drop soup, as far as I know, is a European soup. 1. Bring the chicken stock to a boil and add the tomatoes. If using water, add the tomatoes, bring to a boil and add the ground meat, stirring and whisking with a fork or pair of chopsticks to separate the meat so that there are no large clumps. 2. When the soup comes to a full boil again, switch off the heat and pour the beaten egg with one hand and stir the soup quickly with a fork in circles. Don't pour too quickly or large thick ribbons of egg will form. Make sure the soup is boiling hot or it'll become cloudy. You can switch off the heat in the middle of boiling but do not boil after all the egg is in. If you want a thicker soup, add the cornstarch mixture (adjust the amount to your liking) before adding the eggs, stirring eggs in using a fork in circular motion. Let soup come to a full boil after adding the cornstarch water, switch off the heat and add the egg, doing the same motion as described above. 3. Season the soup with salt and pepper. Sprinkle the spring onions on top. Drizzle with sesame oil if using. Leon & Veronica's 25th wedding anniversary was the first I've ever attended (still looking good, you two!) and it was beautiful, with singing and dancing presentations from their talented nephews and nieces but the most entertaining and heart-warming presentation was by their three kids who re-enacted scenes from their first meeting. My favorite was the 'The Most Awesome Proposal In The World', something like that. I was probably the one who laughed the loudest in the ballroom of over 300 people. And so we did it, decorated 328 cupcakes and a top cake in one day. I wouldn't have been able to do it if not for my friends Elaine, Aifuah and Lily. I started around 9 am while Aifuah came about an hour later and the others before lunch time. We worked so hard that we forgot about lunch (Hub bought some buns but nobody stopped to eat). I had planned to deliver the cakes (this part I hate; I didn't know that I'd have to deliver) by 4 or 5 pm so that the couple can take photos of my piece de resistance before the guests arrive but a near-disaster happened at 2:30 pm and I only got to the hotel at 6:40 pm (the cakes were delivered earlier) to oversee the setting up of the cake stand. Aifuah is the expert in sugarpaste cakes, at least among us, but she got the flu early in the week so she couldn't make the covering fondant on Thursday as planned. 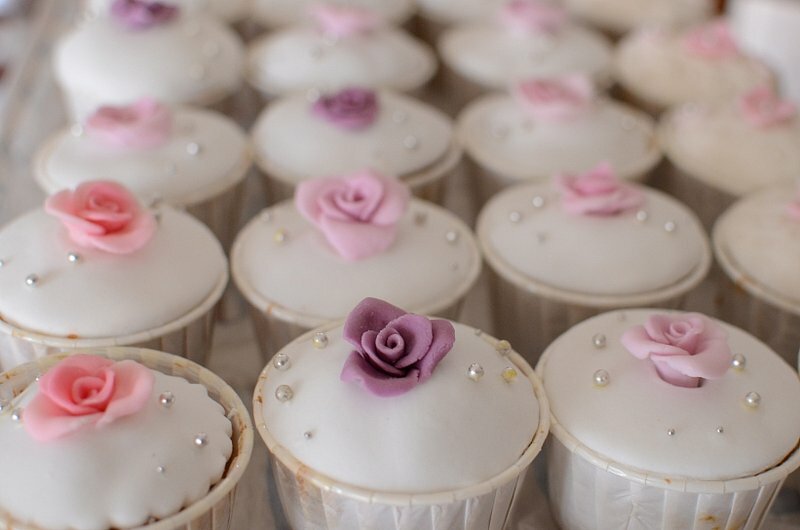 She had made 1 kg of fondant on Monday for the flowers. So I had to get commercial fondant from the stores. Commercial 'rolled fondant' is soft, marshmallowy and very pliable. 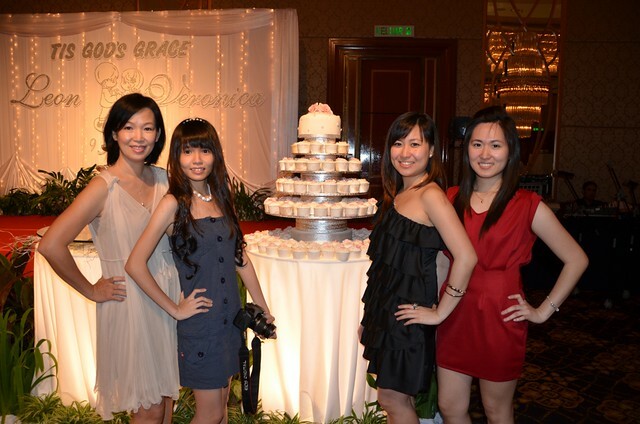 At RM10 a kg, commercial fondant is affordable and SO much easier to use than home-made fondant. 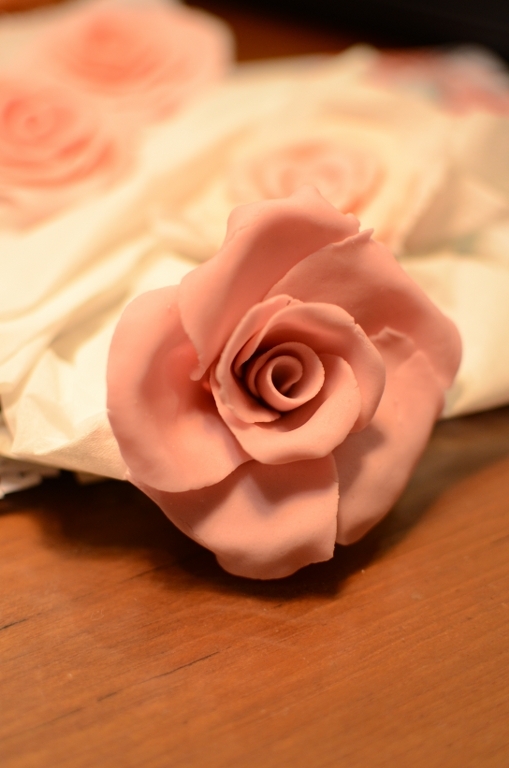 With home-made fondant, I could make a small rose in 8 to 10 minutes but with commercial fondant, which doesn't need much kneading, I could get the same thing done in 2.5 minutes. The near-disaster came when Aifuah draped the covering fondant over the very tall (3 stacked cakes, about 9"/22 cm high) American-style prune buttercake. 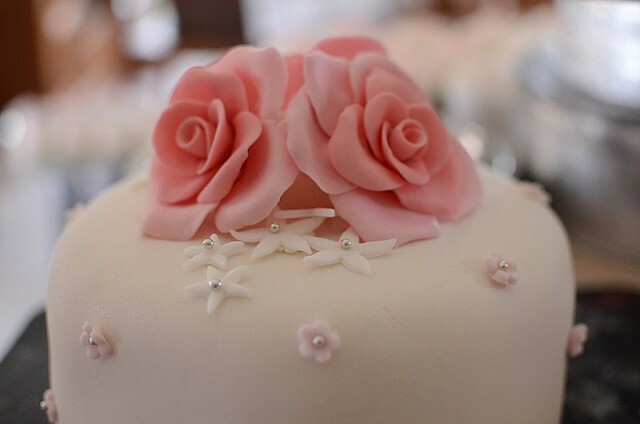 The soft and stretchy fondant immediately pulled off at the edge of the cake top, leaving a piece of jagged-edged fondant on the top and the rest of the fondant around the bottom of the cake. We were stunned! I would have cried if I was the only one doing the job. Aifuah suggested we cover the cake with Swiss buttercream but the butter needed to thaw and the icing would melt if the completed cake was not chilled. Lily suggested royal icing but I haven't made that in years plus it needed to harden. I decided to make our own covering fondant, even at that late stage, because Aifuah and I have made fondant before and it was better to go with something we know. Elaine ran to the nearest cake ingredients shop to get liquid glucose but she also got a kg of imported fondant (lifesaver!). Upon kneading, the fondant was crumbly and dry. Arggghh! In a final effort, I threw the crumbly fondant, the salvaged soft fondant and lots of icing sugar into the mixer. The texture was much firmer and we held our breaths as Aifuah draped the new fondant over the cake (reduced to 2 stacked cakes now). The fondant didn't pull away. By then it was about 4 pm. 1/4 of the cupcakes were still not done because of the fuss over the failed fondant. What have I learnt? 1) Decorating 328 cupcakes and a main cake on the same day is asking for trouble! i should've covered the main cake the night before as planned. I couldn't because I couldn't find 6" round cake boards in the stores for stacking the main cakes. 2) Delivery is part of the deal (I didn't know that) and thank God I got last minute help from friends and their wonderful kids! 3) I have wonderful friends who didn't complain, and instead said they enjoyed themselves. Love you ladies, you did a wonderful job! We didn't cut the tops off the cakes at first and that resulted in gaps between the cakes and the fondant. 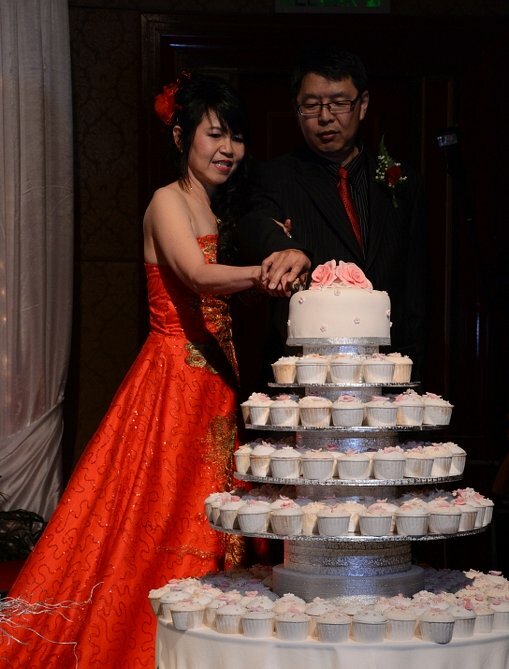 The top cake was covered in ivory colored fondant, flowers were made with home-made fondant. The cake stand, made with the help of Elaine and my helper Vero, was based on a post by Cake Journal. To Iona & sisters: Thanks for delivering the cakes! It's past 1 am and I can't sleep! 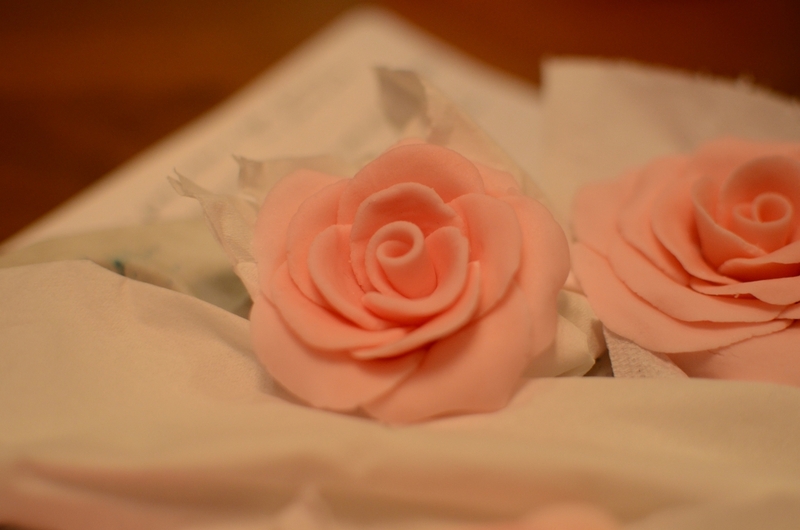 I've been making sugarpaste (fondant) roses all night and just not getting them right. The first practice rose I made was a mixture of the techniques I learnt from a sugarpaste course when Wey was a toddler and from You Tube videos. I was pretty happy with the result, considering that the last time I made roses for a wedding cake was more than a decade ago, and proceeded to the second rose, sticking to what my teacher had taught: roses come in odd petals of 3, 5, 7 and so on. By the time I got to the 3rd row of 7 petals my rose looked like a pink cabbage. No good. I decided reluctantly to forget about rules. The second rose: a pink cabbage. Third rose, petals too thick. The third rose looked better but still didn't look right. I plugged in Hub's laptop on the dining table and spent the next 1/2 hour ogling at Zurin's vintage roses, looking so real and beautiful that it's hard to believe they are made of sugar. They look too difficult and intimidating for me. 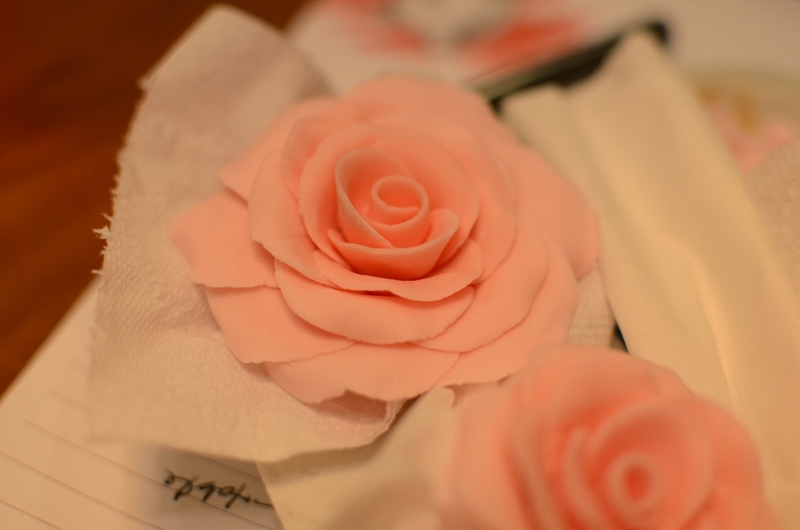 I will have to fly to KL one day to learn how to make roses from Zurin. 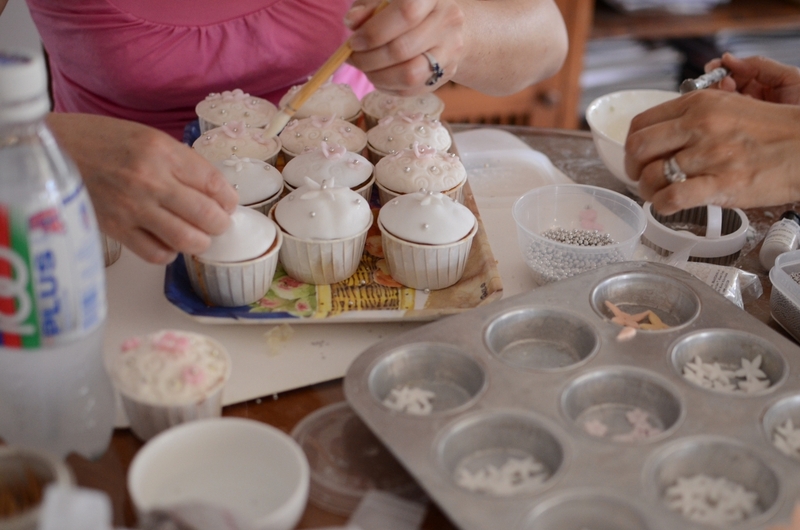 I spent another 1/2 hour at Cupcake Dlights, my top cupcakes and sugarpaste cakes blog crush. Zahirah's only in her late 20s and already made a big name with her creations. My sugarpaste teacher was trained in Australia, a world leader in sugarpaste work, and she mentioned South Africa as being one of the world's best in sugarpaste art and Zahirah is in Durban, South Africa. 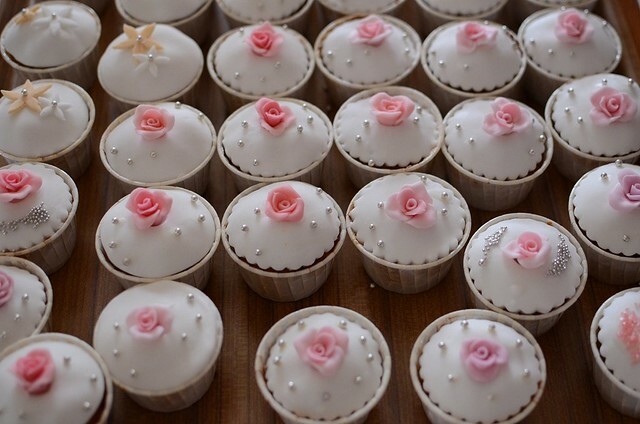 If you go to her blog, click on any photo and that will take you to her Flickr account which is filled with the most amazing cakes. I am just AWED by her skills and her classy designs. Her work is so elegant and classy, I've not seen any gaudy designs, not one. Even her colors are incomparable. I think she mixes them and I don't think it's Wilton colors. If only she gives some tutorials on her blog. Her work is so amazing and breathtaking that going through them I felt like I was in a different world, a wonderland of roses, fairy tale characters and all things nice. My major crush for photography is Norjlus for travel and outdoor photos (another fairy tale world), Stone Soup for her to-die-for food photo skills (I absolutely adore her photos!) 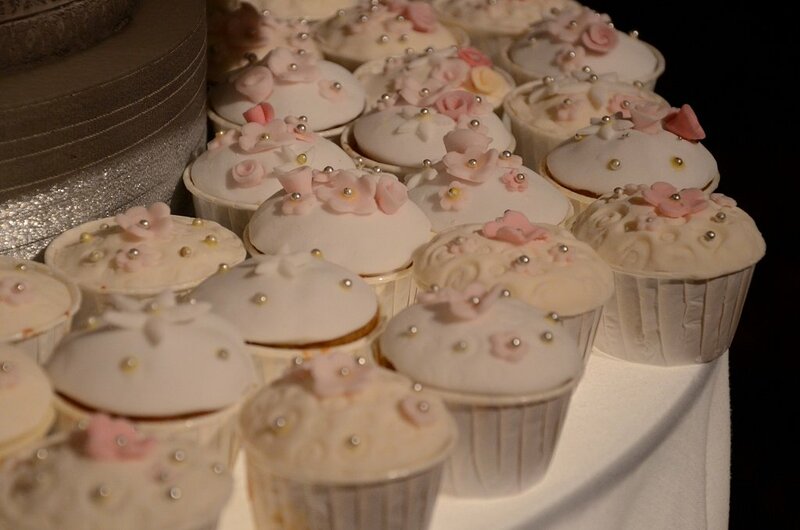 and Cupcakes Dlight for the world's most gorgeous gorgeous cakes and lately photography too. Inspired by CupcakeDlight, I made a simple violet pink rose that looks more like a gardenia. I'm not as worried as I should be about this assignment because I have enlisted two of the best people for the job--A, who said she first learnt sugarcraft from my blog only 9 months ago but now is so good at it (her cakes are awesome!) that I look up to her as my teacher and E, who's an excellent cook and expert at handicraft. What have I got to fear but the wet weather, which prevents the sugarpaste flowers from drying. I am a little bit anxious about whether V will like our creations because she came back from Australia last weekend to arrange her wedding anniversary celebrations and I haven't yet had a chance to see her. She's leaving everything to me, just giving a few instructions about colors and type of flowers. I enjoy having a free hand at making the cake. 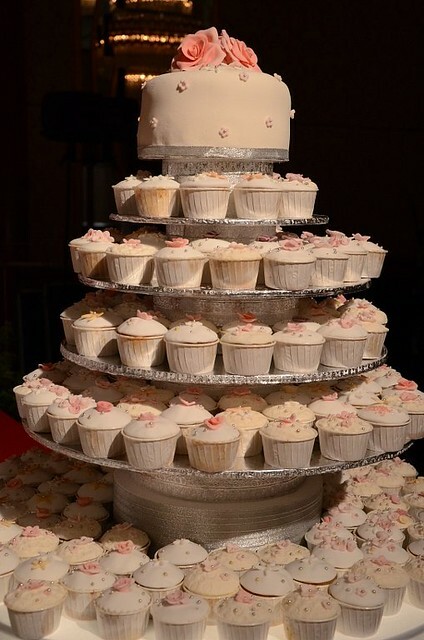 It shall be 6 tiers, the 6th being the table. I will bake the top cake but the cupcakes will be baked by a professional baker because I just can't bake and decorate 320 cupcakes. 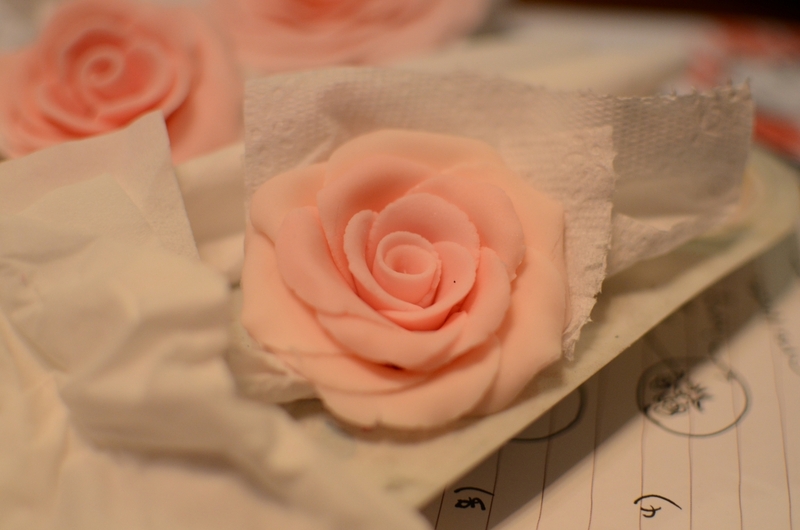 Now I should get some sleep because tomorrow I'm going to make the actual roses for the cake. 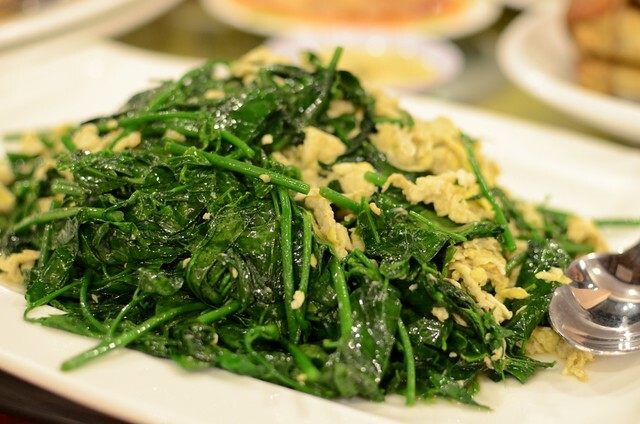 The New Wong Kok Restaurant (NWK) has replaced the New Emperor Restaurant in Luyang. I enjoy the dim sum and a la carte food at the original Wong Kok, especially when it just opened, so I was quite confident that the new branch would not disappoint. In the last two months, I've been to NWK for dim sum twice and dinner 3 times. The dim sum is passable good for KK standards and the a la carte menu items are very variable, ranging from disastrous to very good. The first time I dined there, my hub and I shook our heads all through the meal. We had the stewed pork leg (awful) and the mayo prawns (awful) and a plate of stir-fried greens. I didn't want to go near the restaurant again but this week I had to go twice, for a birthday dinner and a pre-wedding dinner. 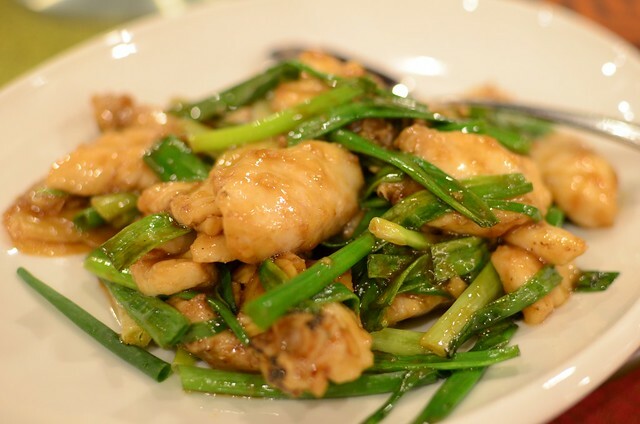 Stir-fried spring onions and ginger grouper slices. 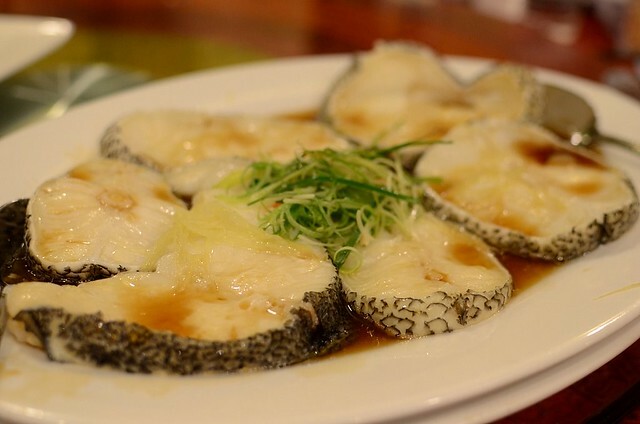 The grouper slices were fresh, meaty, delicious and the skin slightly chewy. 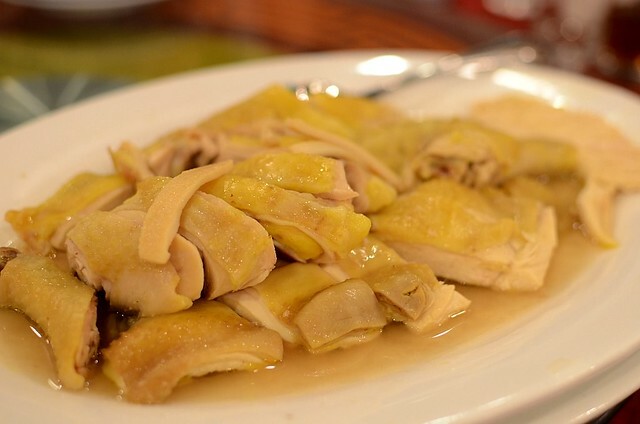 Steamed lean free-range chicken. Served with a minced ginger dip, the chicken was sweet and moist. 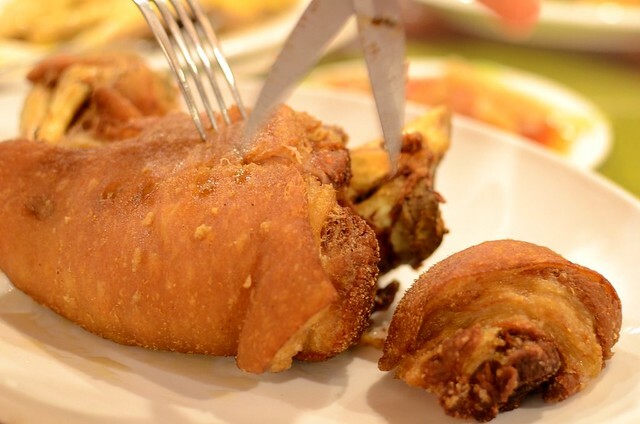 Crispy pork knuckle was good too although my friend thinks Equatorial Restaurant does a better version. Sabah veggies with egg, yum. 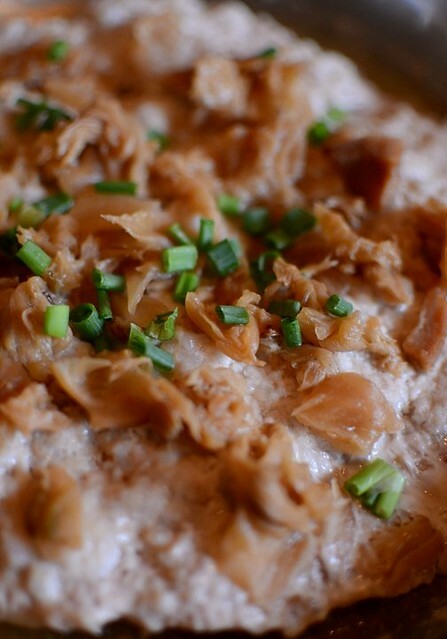 This is a more fancy take on the humble Chinese steamed egg dish. 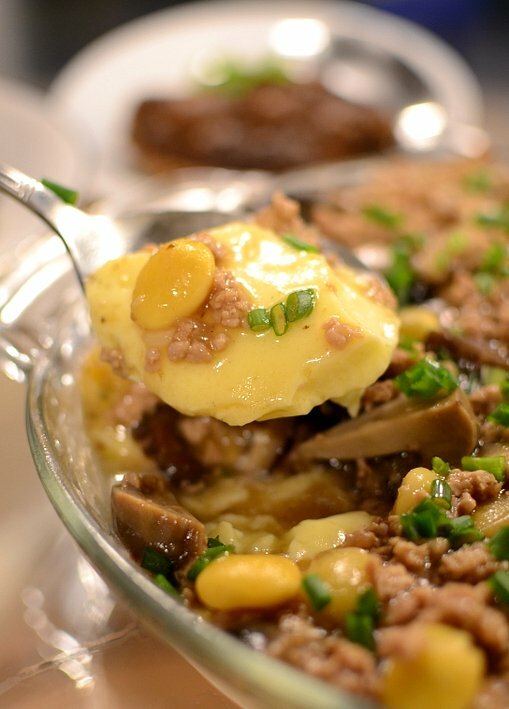 Unlike Japanese chawan mushi, which is served in individual bowls, Chinese steamed egg is usually served in one big dish to share. 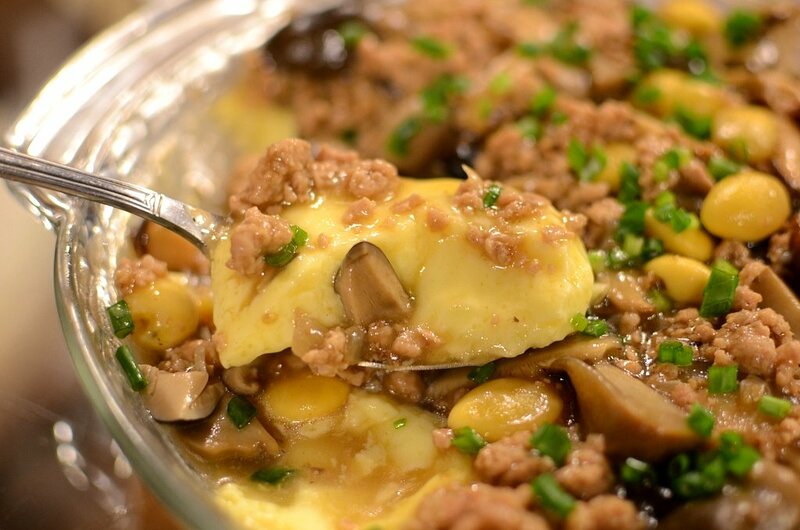 Here, NWK jazzes up the dish by topping it with diced steamed egg, meat and veggies. The surprise was that it wasn't steamed egg but steamed house-made tofu under all those toppings. Yum. I enjoyed this dish and I want to replicate it at home. The next night, we went for a pre-wedding dinner at NWK again and although overall the food was edible (6/10), I came away feeling that the dinner was rather coarse. From the hot platter (6/10) to the fish maw soup (thin, bland 4/10) to the dried shrimps prawns (5/10) to the sweet and sour pork chops (too sweet, pork was too bicarbed, 4/10), I tried to be kind but the food just didn't impress. The only two dishes I liked was the smoked tea leaves chicken and the steamed cod fish but cod being such a tasty fish can't go wrong even in the hands of an amateur. The last dish, taro ring with mixed veggies, was the worst because the taro was off. When steamed taro's been left for too long, it has a slight sourish taste. 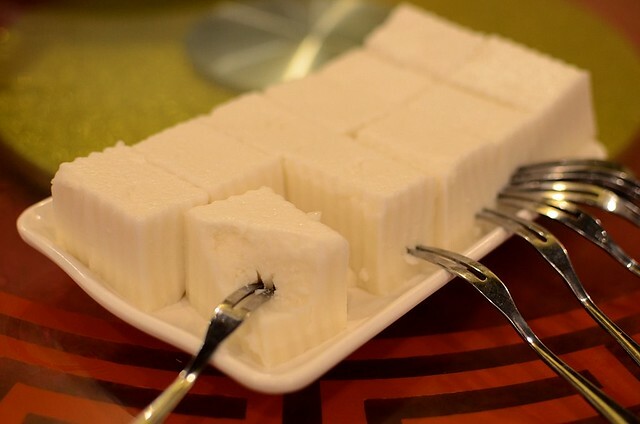 I glanced at the next table of young people and they had finished all their taro whereas at our table, the taro was left uneaten except for one person who didn't have much taste buds. The older adults knew the difference between fresh and gone bad and didn't eat the taro. And that's one thing about young people these days. They can't tell if they are eating food that's off. They just wolf everything down. Except for my Sniffer, who, like me, dropped his piece of taro at first bite. We complained and the waitress said "Thank you, thank you". Thank you for what? No apologies, no offer to replace the dish or refund the money. 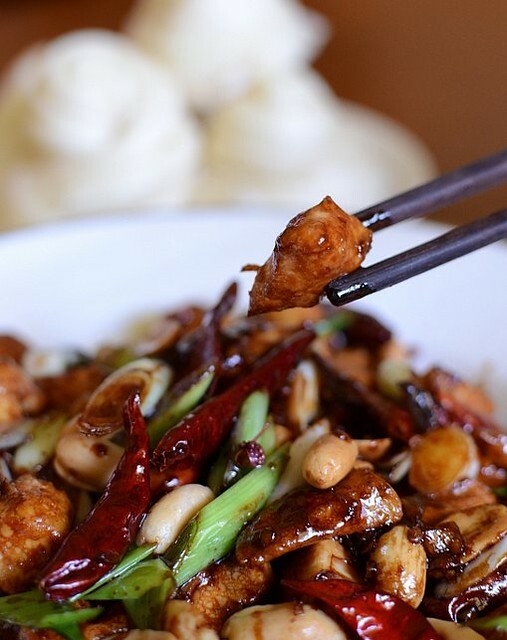 The thing about most Chinese restaurants is, customers are always wrong. I supposed that's why Chinese dining is cheaper. I'm so not going there again except for the dim sum. It's not that I'm difficult to please. It's that a few hours later, my stomach ached. The next day, my mom said she made two runs to the toilet. Enough said. 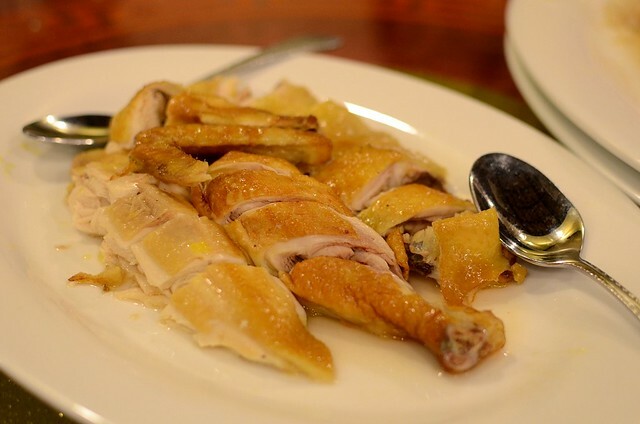 Smoked tea leaves free-range chicken. Similar to the steamed chicken except that it had a slight smoky flavor. Very yum. Make that three items that I liked because I asked for an extra plate of the free dessert, the coconut snow jelly. My son thought it was disgusting because it was foamy but I liked it. New Wong Kok Restaurant, Luyang Phase 1, same block as Apiwon.